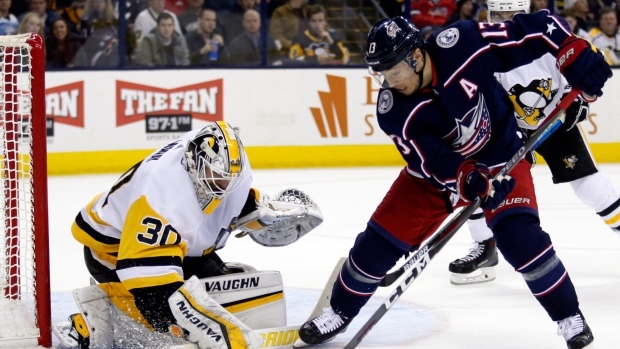 The Columbus Blue Jackets' top line of Cam Atkinson, Pierre-Luc Dubois and Artemi Panarin went to dinner together Monday night in an attempt "to clear the air," Atkinson revealed Tuesday. Atkinson noted that the three players’ body language has been a reflection of their struggles over the past two weeks as the team pushes for a playoff spot. The line has combined for just nine points in nine games in the month of March with a minus-16 rating. Dubois, who has 23 goals and 54 points in 72 games this season, last recorded a point on Feb. 28. Line has struggled for two weeks now, and their body language has gone south with it, Atkinson noted. Despite the Blue Jackets loading up at the trade deadline with Matt Duchene and Ryan Dzingel, among others, head coach John Tortorella has elected to keep the trio together. Atkinson admitted Tuesday their dinner in Calgary was paid for by "a higher-up." The Blue Jackets currently sit in the final wild-card spot in the Eastern Conference with a three-point lead over the Montreal Canadiens. The team has posted just a 5-5-1 record since the trade deadline entering Tuesday's game against the Flames. Atkinson admitted in early February that he was frustrated at times with the decisions of Panarin and Sergei Bobrovsky to test the open market as free agents in July. "I can say, 'What the [expletive], Bread?' and 'What the [expletive], Bob?' but what's that going to do? Trust me, we've had those conversations before, but ultimately it's their decision. I'm not going to hold a gun to their heads, even though I should. I might have to." In addition to Panarin and Bobrovsky, trade deadline acquisitions Duchene, Dzingel, Adam McQuaid and Keith Kinkaid are also pending UFAs. Atkinson, meanwhile, is signed with the team through 2024-25 at a $5.875 million cap hit.